As part of the celebration of Robert Shaw's centenary the Atlanta Symphony is issuing for public sale a live recording of the Beethoven Symphony No. 9, recorded in a single concert with Mr. Shaw and the Atlanta Symphony Orchestra and Chorus just prior to their triumphant 1988 tour to Europe. This particular concert also marked Mr. Shaw's final appearance in Atlanta as Music Director of the orchestra. This recording sets to rights a major gap in the recorded legacy of Robert Shaw. As a young man Robert Shaw prepared the chorus for the legendary 1952 Arturo Toscanini recording. Shaw performed it countless times in his own career. He recorded the 9th for Pro Arte in 1982 but it suffers from over mixed audio which mutes the performance. Later in the 1980s when it would have been possible to re-record the Beethoven 9th in the ongoing relationship with Telarc, the 9th was 'off the table' because Telarc had committed themselves to a complete Beethoven cycle with the Cleveland Orchestra and its then Music Director Christoph von Dohnanyi. Shortly before his death in 1999 Robert Shaw and Telarc's founding producer Robert Woods began planning a Beethoven 9th which ultimately did not come to pass. In recent years Robert Woods has been digitizing all the historic Atlanta Symphony live broadcast tapes. When it came time to preserve the May 20, 1988 Beethoven 9th he wrote: "This performance is one of those in which all of the participants were playing for the sake of the music and were caught up in a vortex of musical union and humanity the likes of which you just don't encounter very often, if ever in a lifetime." The Atlanta Symphony and Chorus opens its 71st season Sept. 17-19 with Mahler’s “Resurrection” Symphony, but in the buildup to that major concert the ASO has announced that it is releasing a recording of a world premiere from the 2014-15 season. The work by Theofanidis, a member of the ASO’s Atlanta School of Composers, was given its world premiere at Atlanta’s Symphony Hall in April. Interweaving texts and ideas from philosophy, science, religion, poetry and literature, “Creation/Creator” is divided into 15 movements, each showcasing different texts and utilizing different musical approaches. The movements contain segments of poetry recitations, a capella choral pieces, orchestral music, electric guitar, saxophone, percussion and vocal sections. AJC classical music critic James Paulk praised the ambition of the 75-minute concert piece, which explores creation and the creative process and relationship between God and humanity. Distributed by Naxos of America, the recording features music director Robert Spano leading the ASO and Chorus. Soloists are soprano Jessica Rivera, mezzo-soprano Kelley O’Connor, tenor Thomas Cooley, bass Evan Boyer and baritone Nmon Ford. The digital release will be available for download on iTunes and the CD may be ordered online at www.aso.org/asomedia or amazon.com. The ASO announced this summer that it would perform “Creation/Creator” when it performs at the inaugural Shift: A Festival of American Orchestras at the John F. Kennedy Center for the Performing Arts in Washington in March 2017. Ralph Vaughan Williams’s Dona Nobis Pacem, subtitled “A Cantata for Soprano & Baritone Soli, Chorus and Orchestra,” is an uncommonly beautiful work. Commissioned by the Huddersfield Choral Society for its own one-hundredth anniversary, this six-movement pacifist work from 1936 — the “gathering storm” pre-World War II era — incorporates three Walt Whitman poems about the Civil War, a House of Commons speech given during the Crimean War, and some Old Testament passages, as well as a portion of the “Agnus Dei text”, which contains the phrase that gives the work its title. As the notes point out, this piece anticipates Britten’s mighty War Requiem in its juxtaposition of sacred Latin text and wartime poetry. The grand and mournful “Agnus Dei,” opens the work, here featuring soprano soloist Jessica Rivera with the Atlanta Symphony Orchestra and Chorus. Rivera, a sensitive, versatile artist with keen musical instincts, has performed extensively with the Atlanta Symphony under conductor Robert Spano. Here, she sings with vibrant tone and an earnest, vulnerable quality as she pleads for peace, but her vibrato centers slightly under the pitches often enough to be distracting. The second movement, Whitman’s “Beat! beat! drums!” is thundering and terrifying, with a text trumpeting the unstoppable war machine that annihilates everything in its path (“Mind not the timid — mind not the weeper or prayer”). Baritone Brett Polegato offers a mercifully soothing contrast to this in the tender “Reconciliation” that follows, his gentle but steel-tinged tone offering strength and comfort. When the chorus enters with an echo of his verse, it’s a sublime moment, as is Rivera’s hushed a cappella reprise of “Dona nobis pacem” at the end of the movement. The magnificent “Dirge for 2 Veterans,” the centerpiece of the work, is a slow-building funeral march with some Mahlerian elements and stunning musical depictions of a “ghastly, phantom moon” and “the strong dead-march” that enwraps the narrator. The fabled Atlanta Symphony Chorus, once the province of the great Robert Shaw, sings with its characteristic precision of ensemble, due no doubt to the efforts of Director of Choruses Norman Mackenzie, Shaw’s immediate successor. The sound, however, is inconsistent: sometimes it’s brilliantly full-bodied, but at other times it’s hazy and diffuse. Breath support and, relatedly, intonation are mostly good, but seem to flag in some key spots. The climax of the last movement in particular loses some of its punch because the chorus recedes into the background, largely overshadowed by the blazing orchestra. The Atlanta forces recorded this work previously with Shaw conducting on a 1998 Telarc disc with Carmen Pelton and Nathan Gunn as soloists. (That disc includes two other remarkable twentieth century choral pieces, Barber’s Prayers of Kierkegaard and Bartok’s Cantata Profana.) Choral–orchestral balance on that recording is generally better, and the choral sound is more compact. The second disc of this set features an impassioned traversal of Vaughan Williams’s intriguing, fiery, and unexpectedly spiky Symphony No. 4, as well as the lovely and ethereal The Lark Ascending (1914), with a pristine, sweet-toned solo performance by Atlanta Symphony concertmaster David Coucheron. 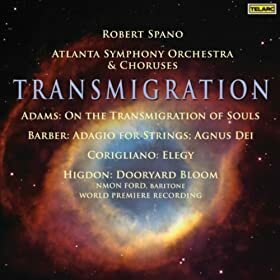 The Atlanta Symphony Orchestra’s first in-house recording on its new label, ASO Media, is out this week, distributed on CD by Naxos and as a download on amazon.com and other sites. It’s a strong showing of music co-commissioned and premiered by the ASO from two of its regular composers, Jennifer Higdon and Michael Gandolfi. And it is fitting that ASO Media’s debut promotes populist living composers, which has become the orchestra’s specialty. There are two other ASO Media recordings set for release later this year. Christopher Theofanidis’ “Symphony” — another ASO commission — is paired with Peter Lieberson’s “Neruda Songs,” sung by mezzo Kelly O’Connor. The third release, for this fall and timed to promote an ASO performance at Carnegie Hall, will be a Rachmaninoff disc with the “Symphonic Dances” and Piano Concerto No. 3 with Garrick Ohlsson as soloist. ASO Music Director Robert Spano conducts all three. The ASO Media debut is sure to catch a lot of attention, especially since Higdon is flying so high just now. She’s among the most performed living American composers, with a 2010 Pulitzer Prize for her Violin Concerto and major commissions stacked up for years to come. Last June, the ASO premiered Higdon’s “On a Wire,” where the venerable concerto grosso form, popular in the Baroque, meets the 1960s experimental theatrics of George Crumb. “On a Wire,” a birdie title, was created for orchestra and the new-music sextet called Eighth Blackbird. The members — covering piano, flute, clarinet, violin/viola, percussion and cello — step out from the larger ensemble for brief solos or sing as a unit. At several transition points, in performance, they all gather around the open piano and bow or pluck the strings, giving the concerto an eerie sound element and strong Crumb-like visual component. Musically, the concerto is pure Higdon, showy, exuberant and beautifully crafted. There are jaunty rhythms that evoke Aaron Copland’s Americana and the melancholy lyricism of Samuel Barber, fused together in Higdon’s bright and energetic style. The concerto’s fragrant, nocturnal middle section includes marimba flutters that sound like a breeze passing through a bamboo forest, with the other instruments offering tender reflections. 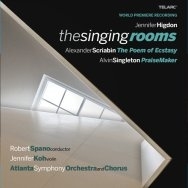 Telarc Release: Jennifer Higdon "Singing Rooms" / Alvin Singleton "Praisemaker"
On the Transmigration of Souls. American conductor Samuel Barber’s Adagio for Strings is widely considered a masterwork of modern classical music. On the advice of Arturo Toscanini, Barber reworked the Adagio movement from his first string quartet for a full string orchestra. Toscanini introduced Adagio for Strings in New York in 1938 and included it on his South American tour program. Through Toscanini’s recording, the Adagio for Strings was Barber’s first work to reach a wide audience. Its sad but noble quality expressed the grief of millions when it was selected for radio play immediately after the announcement of President Franklin Roosevelt’s death in 1945. The piece has since remained among the first choices for music expressing sorrow and honor on the death of great public figures. Barber’s Agnus Dei, performed a cappella by the Atlanta Symphony Orchestra Chamber Chorus, was a choral setting of the traditional Latin prayer “Agnus Dei” derived from the same Adagio movement in his first string quartet, the Adagio for Strings. John Corigliano’s Elegy for orchestra was based on an incidental score he wrote for an off-Broadway production of Wallace Frey’s Helen - an account of the aging Helen of Troy. He dedicated it to Samuel Barber, although it was not written in memory of Barber, as he was still very much alive when Mr. Corigliano wrote the piece in 1965. However, Mr. Barber was a valued mentor and friend, who brought the then-unknown composer to the attention of G. Schirmer, which continues to be Mr. Corigliano’s publisher. Today, Mr. Corigliano is considered one of America’s most prominent composers. He has been honored with a Grawemeyer Award, a Pulitzer Prize, several GRAMMY® Awards, as well as an Oscar for the soundtrack to the 1998 film, The Red Violin. Jennifer Higdon set Dooryard Bloom for baritone and orchestra to Walt Whitman’s landmark American poem, When Lilacs Last in the Dooryard Bloom’d. Whitman originally wrote Lilacs as an elegy to Abraham Lincoln, although the poem never refers to the slain president specifically, allowing for a universal message. In the same way, Jennifer Higdon says, “The beauty of music is the power to suggest things that even words might not convey. Therefore, take your own meaning from this piece, literally or emotionally or metaphorically…let it be your own dooryard.” Higdon’s blue cathedral, a previous elegy, which she wrote in response to the death of her brother, was recorded by the Atlanta Symphony Orchestra and released by Telarc in 2003. The following year, Telarc released the Atlanta Symphony Orchestra’s GRAMMY® nominated recording of Higdon’s Concerto for Orchestra and CityScape. I’ve heard my share of thematically organized recording projects that seem conceptually forced, whatever other attributes they exhibit. Not so with this disc, which excels in every conceivable way. The theme is carefully and consistently maintained with a roster of high quality works by American composers, the performances by Robert Spano and the ASO are spotlessly and thoughtfully realized, and the recorded sound should easily meet audiophiles’ highest standards. The disc title derives from John Adams’ landmark On the Transmigration of Souls. The other works also respond to grief at some level, although the opener, Barber’s Adagio for Strings, hasn’t always worn its elegiac associations so indisputably. Spano’s opening bars suggest a slowish reading, but the pacing overall is sensible, far quicker than Bernstein’s famously sluggish traversal and the recent live performances of podium phenom Gustavo Dudamel. The ASO’s strings are marvelously transparent and precisely balanced, and if his tempos aren’t extreme, Spano coaxes a wide dynamic range from his forces, especially in the gloriously hushed closing bars. There are more intensely raw accounts of the chestnut, but this surely ranks among the more completely absorbing. Just as Barber transferred the Adagio from string quartet to string orchestra, he later re-worked it for choral forces in the Agnus Dei, incorporating the four short lines from the mass. Spano shaves over a minute off his string version, no doubt a concession to his singers’ lung capacity. The ASO chorus has lost none of its legendary clarity and luster, and their angelic performance is almost reason enough to own the disc. Adams’ The Transmigration of Souls from 2002 is the most durable and conspicuous musical monument to the terrorist attacks, and garnered waves of recognition, including the 2003 Pulitzer Prize and a rare trifecta at the Grammy awards. It is also one of the finest American works of the last decade, adding considerable weight to Adams’ argument that new music has an obligation to maintain a relevance to current events, an uncontroversial postulate in the other arts, but oddly suspect among some in our world of “serious” music. It has been correctly remarked that the trumpet solo from Ives’ Unanswered Question makes an oblique, non-literal appearance a few minutes into the 25-minute tone poem, certainly an apt reference, given the subject matter. But I also hear other, more subtle references to the American icon, including some linear and texturally layered sections during which time seems temporarily suspended. It may be coincidental, but Adams had been conducting Ives’ Fourth Symphony not long before his work on this composition. A more notable departure from his standard practice is the use of prerecorded text that includes disembodied voices and ambient city sounds, adding still another stratum to an assemblage that includes orchestra, chorus, and children’s chorus. His language is tonally more ambiguous than most of his earlier works, and dissonances are a bit more prevalent. Other than a few climactic moments about two-thirds through the piece, his minimalist roots play a minimal role. If you don’t own a disc of the work (shame on you!) and are comparing this version to the original New York Philharmonic/Maazel reading, consider these frank remarks from the composer’s recent memoir (Hallelujah Junction—Composing an American Life), in which his opinion of the work rose considerably after hearing Spano and the ASO: “[T]he piece did not seem as compromised and uneven as I had previously thought.” There are certainly no obvious faults in the debut recording on Nonesuch, but Spano has woven the disparate elements together more seamlessly, the chorus is peerless, and the recorded sound is appreciably better than the serviceable live recording in Avery Fisher Hall. The other large work on the disc is Jennifer Higdon’s Dooryard Bloom, taken from her adaptation of Walt Whitman’s poem “When Lilacs last in Dooryard Bloom’d,” a lamentation on Lincoln’s death (though his name is not mentioned) and a common source of musical settings. Higdon’s 2005 piece is scored for baritone and orchestra, sung here by the Nmon Ford. The singer gets to the heart of the mournful texts with a warm, soothing, and ardent delivery. Unlike the fragmented texts in Adams work, Higdon spins a real-time delivery of the poem, paced not dissimilarly from a spoken recitation. Textures are relatively spare, giving ample space for clear declamation from the voice. The musical language ranges from a soothing, clear-eyed Americana (alluding perhaps to Copland’s Lincoln Portrait) to more ambiguous tonal wanderings and misty atmospherics that mirror the shifting moods of the text. It’s an engaging work, though it succeeds better as a vehicle for a landmark poem than a musical masterpiece. If Adams moves out of his comfort zone, John Corigliano’s Elegy comes from a less risky era of his career. This is no doubt due to two factors: the early date of its genesis (1965, while he was still firmly under the spell of the American Romanticists) and its history as an excerpt of instrumental music for Wallace Fry’s play Helen. He is under Copland’s spell here; that is, the portentous and mildly combative Copland more than the lyrical one, though in the notes he mentions the effect of Barber, Piston, and William Schuman (for the record, I detect nary a hint of Piston). By turns, the eight-minute work is soothing and soaring, easily achieving its modest aims—an impressive first orchestral work for the young composer. I rarely describe a disc as “must have,” but this time I’ll make an exception. I suppose there may be some who would object to the consistently slow tempos and cheerless mood as disqualifying factors, but if they do, they are ignoring a key aspect of music’s ability to move souls. Loss is part of life, and this lovingly conceived project makes that point clearer than any other I have heard. Superb music recorded with great skill, a mandatory purchase! This is a great album, make no mistake. The reason for my ½ star of hesitancy is because I still wish that the thing was released on SACD. Telarc’s website says “one format” meaning (in their case) regular CD downsampled from DSD masters, but they have often then been releasing some months later in SACD surround format. Both of the Barber works have been recorded by Telarc before, the Adagio on an all-Barber disc by Yoel Levi some years ago that got great reviews and is still one of he best available. The Agnus Dei was set down by the Robert Shaw Festival Singers. Both performances are excellent, but since these two works serve as bookends to this recital it does little good to compare them. The new ones are also very fine, Spano’s Adagio being a little more expansive than Levi’s and this time a much bigger choir than Shaw’s Festival Singers. The John Adams has already had a triple award Grammy winner in the Nonesuch recording, so it takes a little bit of chutzpah to record it again. But this version is in my opinion better than the Nonesuch because the choral work is so much more refined and dramatic, though the Nonesuch remains a superb reading and I doubt this one will top it critically, except by me. It is a powerful work of great substance of memory and regret, and should be heard by anyone who was impacted by 9/11, meaning everyone. There is more music on this disc, so if you have not heard the piece this is the one to get. John Corigliano’s Elegy is an early 1966 work that expressed sorrow over lost youth, in this case Helen of Troy, based on a piece he had written for an off-Broadway production of Wallace Ford’s Helen. The work, dedicated to mentor Samuel Barber, is very much in the Copland/Barber/Bernstein neo-romantic mode of the time. Jennifer Higdon is in my assessment one of greatest of the newer composers, already lionized on many recordings, including the Atlanta Symphony, who recorded her Concerto for Orchestra, the piece that launched her career in Philadelphia in 2002. This work, scored for orchestra and baritone, is based on Walt Whitman’s When lilacs last in the dooryard bloom’d. It is an amazing contrapuntal delight that strikes just the right mood of Whitman’s poem, exploring tonal ranges that I have not heard in her music before, with an amazing transparency in the vocal part that integrates seamlessly with the orchestra. This piece, premiered in 2005 by the Brooklyn Philharmonic, is the finest I have heard by her to date, and may even—if one can be so bold—equal the parallel work by Paul Hindemith, also recorded with excellence by Shaw and the ASO some years back, and still the best version of the piece. So this is a complete winner by any set of standards; not something I’d put on at a party, but certainly something designed for reflection and quietude - just downright worthwhile and inspiring music. In December 2009, the Atlanta Symphony Orchestra Chorus returned to Berlin to perform Brahms" "Ein deutsches Requiem" with Donald Runnicles conducting the Berliner Philharmoniker at the Philharmonie. The Brahms Requiem was performed in Atlanta's Symphony Hall with Donald Runnicles & the ASO before the Berlin Tour. There is a continuing opportunity to see and hear the archived Berlin event via the Berlin Philharmonic's Digital Concert Hall . 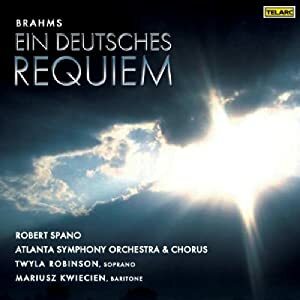 Telarc has released Brahms’ Ein deutsches Requiem, recorded in the fall of 2007 by the Atlanta Symphony Orchestra (ASO) and Chorus in a performance the Atlanta Journal-Constitution said “sparked hair-raising intensity.” The performance features baritone Mariusz Kwiecien, soprano Twyla Robinson, and is led by ASO Music Director Robert Spano. Johannes Brahms wrote Ein deutsches Requiem (A German Requiem), Op. 45, following the deaths of his mother and Robert Schumann, his mentor. Although Brahms based his Requiem on scriptural passages, beginning and ending the work with a blessing “Blessed are they who mourn, for they shall be comforted” (Matthew 5:4), he didn’t write it as a religious piece concerning itself with the souls of the departed, but as a cantata whose message is of comfort, acceptance, peace, and serenity for those left behind. The message seems particularly fitting for the world we live in today. The interesting fact that it contains none of the traditional text expected of a Requiem Mass, nor any of the colorful images that other composers have painted to illustrate those words in their music, is what makes this Requiem stand out from the rest. Following the 1868 Good Friday premiere of Ein deutsches Requiem, conducted by Brahms himself at the Bremen Cathedral, German composer Albert Hermann Dietrich commented: “It at once became clear to the audience that the Deutsches Requiem ranked among the loftiest music ever given to the world.” Brahms initially premiered the work with six movements, but added a seventh in 1869. The seven-movement version soon received performances throughout Germany, Switzerland, England, Austria, the Netherlands, Russia and France, and firmly established Johannes Brahms as a leading composer of his generation. Music Director Robert Spano, now in his seventh season as music director of the Atlanta Symphony Orchestra, is recognized internationally as one of the brightest and most imaginative conductors of his generation. Since 2001, he has energized and expanded the Orchestra’s repertoire and elevated the ensemble to new levels of international prominence and acclaim. Spano was recently named 2008 Conductor of the Year by Musical America. In celebration of its 30th anniversary, Telarc is releasing three completely different Spano recordings in 2008, showcasing his multi-faceted career. First reflecting Spano’s commitment to living composers through the Atlanta School of Composers, Telarc released the world premiere of Michael Gandolfi’s The Garden of the Cosmic Speculation in February of 2008. Ein deutsches Requiem showcases Spano’s agility with the chorus. In July 2008, Telarc will release the highly anticipated first American recording since 1956 of Puccini’s La Bohème. 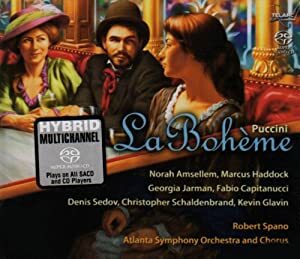 Telarc International and the Atlanta Symphony Orchestra will release a brilliant recording of Puccini’s much-loved opera, La Bohème. The 2-disc recording features a full 88-page libretto, and will be available in retail stores at special 2-for-1 pricing. As even the casual opera fan knows, La Bohème is the story of friendship, love and loss in a community of bohemians in 19th century Paris. For its time, the story was the antithesis of the usual elements of melodrama (intrigue, violence, jealous rage, assassinations, etc.). Instead, La Bohème is an intimate view of the intertwined lives of a colorful group of young individuals. The cast of La Bohème is a dynamic group of talented performers. Soprano Norah Amsellem (Mimi) has sung La Traviata’s Violetta at the Vienna State Opera, Turandot’s Liù at the Metropolitan Opera. Soprano Georgia Jarman’s (Musetta) has performed at the New York City Opera and Cincinnati Opera, and has been engaged by the Caramoor Festival, Glimmerglass Opera and Dallas Opera, among others. Tenor Marcus Haddock (Rodolfo), who has performed at the Paris Opera, La Scala, Metropolitan Opera and Lyric Opera of Chicago, is known for both dramatic intensity and technical brilliance. At age 23, baritone Fabio Maria Capitanucci (Marcello) won the Singing Competition of the Teatro Lirico in Spoleto Italy. A regular guest at La Scala, Capitanucci has performed La Bohème’s Marcello, Un giorno di regno’s Cavalier Belfiore, Manon’s Lescaut and Cosi fan tutte’s Guglielmo. Other cast members include baritone Christopher Schaldenbrand (Schaunard), bass Denis Sedov (Colline) and basso buffo Kevin Glavin (Benoit/Alcindoro). Given the mass appeal of Puccini’s La Bohème, this new recording is being offered at 2-for-1 pricing in order to make this popular work available to the broadest possible audience. This recording is made possible in part through a deeply appreciated gift from Catherine Warren Dukehart. This season marks the 30-year association of Telarc and the Atlanta Symphony orchestra. During that time, the ASO has recorded almost 100 albums – a body of work that has been recognized with 26 GRAMMY® Awards. Now in his seventh season as music director of the ASO, Robert Spano has enriched and expanded the orchestra’s repertoire through his characteristically innovative programming. As a result, he has elevated the ensemble to new levels of international prominence and acclaim. Since he began his tenure with the ASO, he has conducted the orchestra in 10 recordings, winning six GRAMMY® Awards in the process. Now in its 63rd season, the ASO is considered one of America’s leading orchestras, well known for its impressive list of GRAMMY® Award-winning recordings, its renowned choruses, and for the excellence of its live performances.